Religious communities have a prophetic dimension as an integral part to their charisms. Augustinians live this dimension through its witness to community on several levels: local, regional, and international. The origin of community emerges from one’s communion with God as the source of life, from which that communion experience is shared with others. This experience is expressed at the local level with one’s immediate communities or through a collaboration of ministries or pastoral concerns on a regional level. As the world becomes more globalized, Augustinians are mindful of an international communion, grounded not on the power of a few, but on the praxis of dialogue and participation of all. Theologically, the vision of the global community reflects the body of Christ (1 Cor. 12: 12-31) and the core principle, also called by Ange Le Proust “the Augustinian secret,” to carry each other’s burdens (Gal. 6:2). The “secret” becomes open in attitudes and commitments to social justice. In this brief essay I want to present a broad outline on how this prophetic dimension might work out. Obviously, there are many approaches to realizing the charism on the local, regional, and international levels. Whatever approach one takes, some considerations must be in place. This approach will highlight important elements within the UN system that impact the local and regional levels. Secondly, in order for local and regional communities to connect to the international level, such as the UN system, they should be aware of the principles of Catholic social teachings and methods for reflecting on one’s reality. Therefore, the three areas are the UN system, Catholic social teaching, and methods for reflection. A balanced tension between the international and local gives expression to the circular movement expressed in paragraph 185 of the Order’s Constitutions. In 2015, countries adopted an agenda with 17 targets for the year 2030 that will mobilize efforts toward transforming our world. 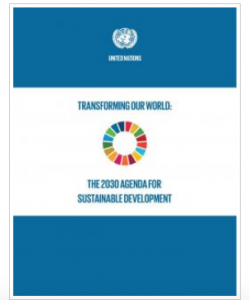 The 2030 Agenda, also called the Sustainable Development Goals (SDGs). Governments, businesses, and civil society with the UN are to begin action with these goals. So important are the SDGs that everything done at the UN is through the lens of the 2030 Agenda. If a local community wants to have a voice at the UN, it is more effective to do it through one or more of the SDG targets. Due to the consensus reached by the nations, this agenda resembles the common will and restless desire of humanity for a better world community. 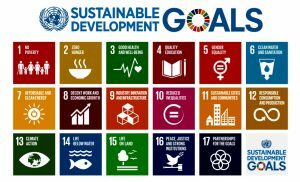 Augustinians should be familiar with these resources on the SDGs. Familiarity with the booklet “Transforming our World” is a good place to begin. One of the best secrets in the Church is a body of literature on social justice called Catholic Social Teaching (CST). The Church has always grappled with the great questions about what it means to be a human person in society. As society becomes more interconnected, technological, and global, the person of faith must intersect with the economic, political, and social realms. Answers have been explored in homilies, pastoral letters, academic essays, catechetical materials, documents of religious orders and lay institutes on behalf of the most vulnerable in society. On the concepts. Principles and Seven Themes of CST – access here. A wonderful book for students and study groups on how to apply CST to issues like immigration. Collier and Strain, Global Migration. What’s Happening, Why, and a Just Response. Access here. When confronted with social issues like immigration, poverty, and the impact of climate change, communities ponder ways of responding. A method for thinking critically through the issues is vital, otherwise biases and assumptions will be projected on to the other. Two approaches of critical reflection are offered for communities to adopt. This method has its inspiration from the writings of the Canadian Jesuit Bernard Lonergan. The core of his thought revolves around the notion of the transcendental precepts: Be attentive, be intelligent, be reasonable, be responsible, be in love. These precepts are born of evolution and are built into our psychic makeup and not just a set of logical tools. Regardless of our culture, language, or social condition, we naturally go through this process of knowing and understanding. We all wonder and want to know why. We begin to ask questions and find answers. These answers lead to connections, linkages, insight, and to further questions. We make judgments about the situation based on values we hold dear, such as the dignity of the person and the common good. We then make a decision to act. When judgments are made according to the values of the true, the good, and the beautiful, actions will contribute to human flourishing. When they do not, they contribute to decline and breakdown. Individuals practice the transcendental precepts in their daily lives. However, communities can also practice the precepts by observing their situation (be attentive!) and asking and answering questions about it: Who? What? Where? Why? How come? Data must be collected (Be intelligent!). After gathering the data and insights relevant to the matter at hand, the community contemplates the data, and asks “Is it so?” “Is this what it is all about?” “Are there more questions to be asked?”(Be reasonable!). If the community believes it has the understanding, limited as it is, then it makes a judgment about the situation according to a set of values (core principles of CST and Gospel values). A decision to act or not is then embraced (Be responsible!). These are the transcendental precepts and if a community is faithful to the practice, it creates necessary conditions and increases the probability for something more human, just, and loving to emerge. The precepts are transcendental because they move the person or community beyond itself, to the restless search “for the more.” That “beyond” is the personal encounter with a loving God, the ground of all our feelings, decisions, and actions. St. Paul writes about the love of God welling up and overflowing within our hearts (Rom. 5:5), a favorite verse cited over 700 times by St. Augustine. This experience of divine love and being loved impacts our decisions, judgments, inquiry, and perception of all that is around us. The method of the transcendental precepts is another way to speak of restless hearts of faith seeking understanding, acting, and loving. A helpful guide for understanding Lonergan’s transcendental precepts is Mark T. Miller, The Quest for God & the Good Life. Access here. Other sources on Lonergan’s writings. Access here. Links to Lonergan in Spanish: Access here. The second method is similar to the first. People are more familiar with the “See-Judge-Act” approach for exploring issues. This method, first developed by French priests working for social justice, was employed in a movement called Catholic Action. The method was further developed in the 1960s in Latin America by religious communities and small groups called basic Christian communities. Peasant and rural communities organized themselves in these groups to reflect on unjust structures oppressing the poor. This method continues to be used by those working on social justice issues. The first step in the see-judge-act method is to “see” what is going on in a particular environment. Social analysis and data gathering are important in this phase of inquiry: What is really going on? Pope Francis calls us to see with the eyes of faith. What are the “signs of the times”? Jesus’ words come to mind: Why do you not know how to interpret the present time? (Lk. 12:56). One must not just “look.” “Seeing,” on the other hand, requires asking and answering many questions in order to understand the root causes of a situation. Every issue is the result of a complex set of social, economic, political, and geographic forces, which can be daunting in comprehension. Committing oneself to understanding the complexity underlying social issues is a form of 21st century asceticism. The second step in this process is evaluative. In difficult times one might feel overwhelmed and paralyzed. It is valuable to have a moral compass to move beyond feeling helpless. This step requires bringing together the data, stories, research, and insights in step one and analyzing them with the moral compass of CST and the Gospels. In prayer, communities might contemplate this question: What three issues impact this environment, that if we do not respond to them right now, there will be drastic consequences against the wider community 25 years from now? This step takes the collected data to prayer and contemplates the long-range consequences. Action without ethical reflection is blind, but ethical reflection without action is pointless (Collier and Strain, 110). Motivated by the urgency of issues and having reflected on these issues in a critical manner, people make a decision to act. As Augustinians, we want to keep paragraph 185 of the Order’s Constitution in mind personally and as an item for discussion within local communities. Along with this document, reflection on the SDGs is the following step: What are the urgent needs? What categories of the SDGs do they fall under: Goal #1 – “Eradicate poverty,” Goal #4 – “Quality Education,” or Goal #13 – “Climate Action”? Identify the goal(s) and then consult the booklet “Transforming our World” and study the action-targets of that goal in the booklet. Working in this way and connecting this activity with the Augustinians International office and its resources in New York is one manner in which the local and regional concerns find voice at the international level.